Facebook began testing an update to its mobile notifications tab in April, and it is now “gradually” rolling out the finished product to users of its flagship iOS and Android applications. Friends’ milestones, such as birthdays and life events. Sports scores and reminders about television programs, based on pages they have liked. Upcoming events they have joined. Movies playing in nearby theaters. Nearby restaurants, with links to their pages and reviews. Every day, people use their notifications to keep up-to-date with their friends and family. We’ve heard feedback that people wanted to add important information that they can easily see, all in one place. With this update, your current notification settings will not change, and you can adjust those any time in your settings. You can also customize the info you see by tapping the arrow to the right of each card, or “Add More Cards” at the bottom of the tab. These new personalized options will gradually roll out to Facebook for Android and iPhone in the U.S. 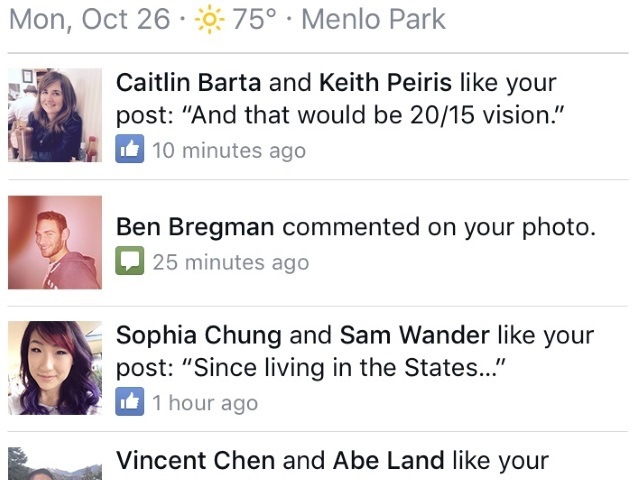 Readers: What do you think of the enhancements to Facebook’s mobile notifications tab?